$139.00 & FREE Shipping on orders over $59. 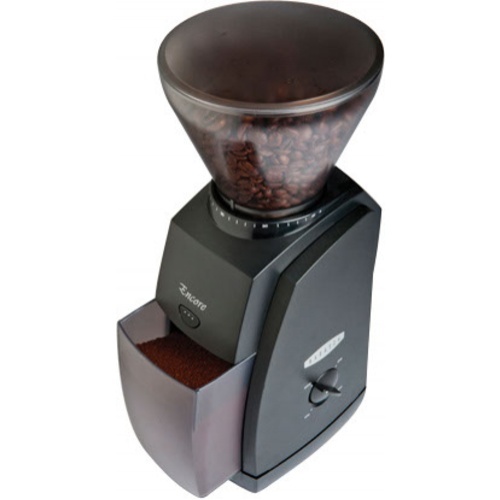 From Baratza, one of the industries leading grinder manufacturers, the Encore is the nicest grinder we offer. Featuring 40 individual grind settings, from fine to coarse, the Encore can please any palate with its gamut of accurate and repeatable grind settings. The Encore has an accurate medium to coarse grind for the increasingly popular manual brew methods such as pour-over, Aeropress, Siphon and Chemex. The specially designed burrs give a precise grind with minimal fines for a flavorful, balanced extraction when making espresso. The first grinder arrived intact but didn't power on. Dead on arrival. Nada, nothing. Morebeer replaced it without question. So far so good. The replacement grinder lasted about for a year of moderate use; just my wife and I making a small pot of coffee each morning. Suddenly, it won't grind a single bean. One morning it was working fine; the next day, no grind. It powers on but the beans seem to be unable to get into the grinding area. I guess I'll send it in. In the meantime, back to pre-ground coffee. Yuck! I had another Baratza grinder before these grinders. That one gave good service for 5-6 years.